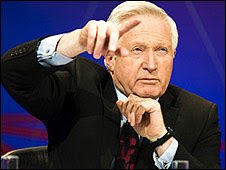 Recently there has been a reminder to the audience that the BBC's Question Time panel does not receive the questions in advance, to various assorted gasps of amazement. How can the panel know the answers? They come with reams of notes. They must be prepared in advance! Well, of course, it isn't that hard to guess the questions. Look at the news and look at where its being held. But it is difficult to get five out of six, in the right order, plus a fluffy quickie for the last question. My secretary Miss CD, is a regular winner of our office Fantasy Question Time, so she will be picking the top 6 questions for tonight's QT from Milton Keynes. Obama and his reigning in or perhaps even splitting of the banks? Too new? 1. Haiti - is the UK/USA/UN in charge? Final question - Something to do with a Prince Harry Aussie comment. 2. Cadbury - British jobs for British workers. Spice Girls musical soft q. The 'Banks never too big to fail' story will make a late entry. Almost guarantee an Iraq question. Andrew Roberts on, of famous quote "Iraq has been a victory for the US-led coalition" and that "history will probably, assuming it is researched and written objectively, congratulate Mr Bush". Well first out was Iraq. Again! Quite surprised it was first question, phrased as a setback for Labour. The usually so lightweight she has to be Sarah Tether was convincing on this, and on calling the PM to go to the enquiry early, and low and behold, within minutes of the recording ending, ***SKY BREAKING NEWS ** Gordon is now going to give evidence before the election. Nice work guys - no mention of te banks, QT stays away from difficult questions that require more than grandsatnding.